As we conclude our fourth year at Edinburgh Feasts, we take a look back on what this year has uncovered. We have reviewed 54 restaurants in 2018, 8 of which have gone into our highest scoring reviews. Here are some of the highlights. We have fallen in love with Mono and have now visited multiple times this year. We first went for the tasting menu but have also been back for the lovely lunch menu. Mono offers contemporary Italian dining and really delivers some very exciting food. It’s worth heading to Newington for this beauty. Sonder offers contemporary European cuisine with bold flavours and clever combinations. We adore this place. Formed after the dissolution of Norn, Borough down at The Shore offers effortless dining and dishes you find yourself thinking about for some time after. We couldn’t omit the sensation that is Six by Nico. This place caused a stir in Edinburgh throughout 2018. Changing it’s themed set menu every 6 weeks, there should be something to take everyone’s fancy. It’s also very reasonably priced. Although here at ‘Feasts we had to force ourselves to miss a couple of these in order to avoid starting a habit! Sublime flavours with Scottish ingredients, Forage and Chatter knows how to create amazing plates of food. You feel you’ve been hugged and wowed in equal measure. We are still talking about this dish a month after eating it. Enough to turn a sprout hater’s head. Hands down, Six By Nico makes the most amazing espumas. How can so much flavour be packed into such a simple dish? They say it’s voted the best in Edinburgh and I’m not sure I can argue with that. Surprisingly, two of these were actually reviewed in 2017, so good to see they are still useful. Lastly, here is an little infographic about Edinburgh Feasts over the past year, which includes some of the information above. In 2019 we’ll still be eating at plenty of new places so come back and visit, or subscribe by filling in your email address into the subscribe option in the menu (left hand on desktops and settings icon on mobile). All the best for 2019 and thanks for supporting Edinburgh Feasts! 2016 was my second year in the blogging arena. Somehow I managed to eat at fewer restaurants than in 2015 (68 versus 78 last year) I think mainly due to revisiting some favourites, but the blog has had over 20% more hits and 15% more visitors, so I think things are still going well. This year the best experience comes as no surprise – Kitchin. The tasting menu is excellent value for money, the food is exciting and so tasty. The man himself is often in the kitchen too, which cannot be said for all chefs at Michelin starred restaurants. Special nods should also be given to Dishoom, Bon Vivant, Reekie’s Smokehouse, Atelier, Norn, Rollo and Seasons who all made it into my highest scoring reviews this year. You can read more about all my highest scoring reviews, which I call my ’35 club’ here. There are always so many contenders in this category so, as I did last year, I’ve picked on the basis of food that I am still thinking about now. Sea bass at Bistro Provence. This was a superb dish. Although it is almost a year ago, I still think about how good it was. Hopefully, when my hectic dining schedule allows, I will get to go back there. Meltmongers – Big Cheese Toastie. Meltmongers has taken Edinburgh by storm and this cheese toastie was simply excellent. Who knew cheese toasties could be this good?! BBQ Beans at Reekie’s Smokehouse. Simple food but the flavour is amazing. I have been back for more of these and still love them. Mun Tod at Ting Thai Caravan. Ting Thai Caravan often has queues outside and its communal dining isn’t to everyone’s taste but these sweet potato crispies were phenomenal. Again, I have been back to eat these again (and also had a lovely sea bass dish on that visit). Classic queso fundido at Topolobamba. Cheesy goodness and nachos. What more do I need to say? Foundry 39’s Tomato and Parmesan Dough Balls. I knew I was in love with this as soon as I saw a photo on social media but once I tried it I was hooked (for the photo, see below in the Favourite Photographs section). Venison at Bon Vivant. Bon Vivant did many things well on our visit but the flavour in this venison was something special. Sea trout at Atelier. I loved the food at Atelier but there was something special about this sea trout. I think it was the pairing with wasabi that took it to another level. Keema Per Eduu at Dishoom. I have yet to have anything other than brunch at Dishoom but it was such a fantastic experience. This was a special dish and hearty at that. Although the nann rolls are also excellent. Sweetbread at Kitchin. I had these a few years ago at Kitchin and coming back with my blogging head on, I was still blown away. The taste was exquisite. Conclusion: Sea bass photographs well. 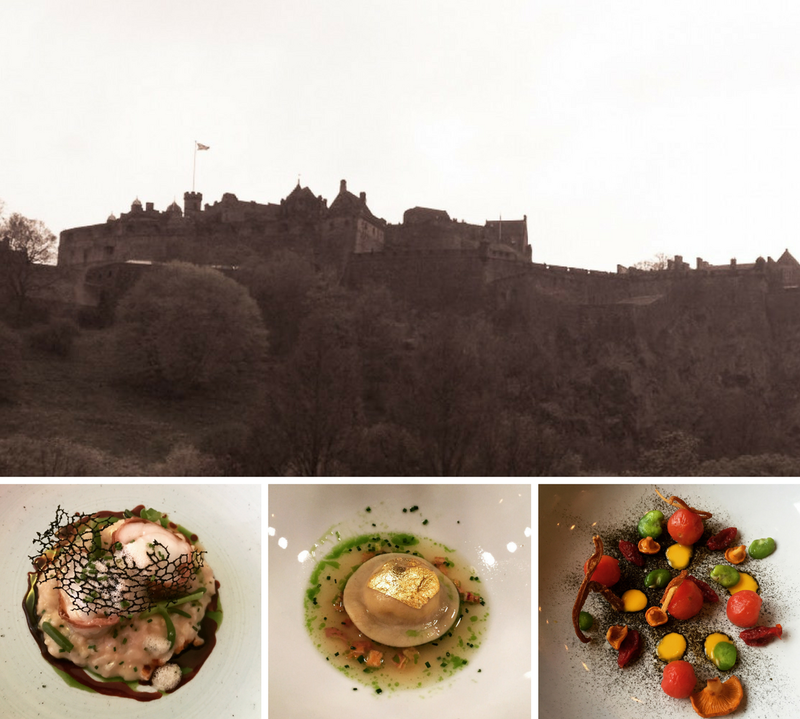 Well although I have managed to go to plenty of restaurants since starting this blog, the Edinburgh dining scene changes its face frequently and there are new places that have opened that I need to try along with some more established places I have yet to get to. I already have several bookings for 2017 so I cannot wait to get started. Finally, I’d like to thank those of you who have taken the time to read my blog and I hope at least some of you have found it useful. Here’s hoping you all have a wonderful 2017! Well 2015 was my first year in blogging. I have managed to eat enough to review 78 restaurants this year. That’s a lot of food! So I thought a little look back at the year’s eating was called for. This year the best experience was tied between Timberyard and The Table. Both fine dining offerings are trying to do something a little bit different without the need to be wacky. Whilst a little on the pricey side, I whole heartedly believe they are worth it. Special nods should also be given to Aizle, Purslane, Mark Greenaway, Tutto Matto and Boozy Cow. You can read more about my highest scoring reviews, which I fondly call my ’35 club’ here. There are so many contenders in this category so I’ve picked on the basis of food that I am still thinking about now. Timberyard – Asparagus and Duck Egg. This was just an amazing dish and gave so much flavour from what appeared from the menu to be quite simple. The egg made the whole dish so creamy. Yum. Galvin Brasserie De Luxe – Steak Tartare. Regular readers will know that I love a steak tartare and I’ve had several good ones this year. However, nothing ever seems to beat this one. A nice balance between the meat and the sharpness of the capers and gherkins makes it sublime. The egg and toast just finish it off perfectly. The Table – Werthers Not-So-Original. This was a surprise and a delight to the palate. Whilst not looking much to start off with, the sentation and flavour in the mouth was a pure joy. Pickles – sharing board. This was just the board that kept on giving. Lovely meats, cheeses, pickles, chutneys and bread. Nom. The Potting Shed – Whitebait. This is a strange one to put in as the Potting Shed gets very mixed reviews (but did ok on our visit apart from the horrid dessert). However, this whitebait was just amazing. I should have just ordered two portions of that and I would have been very happy. The aioli that came with it set it off nicely. Miros Cantina Mexicana – Frozen Margarita. Ok, so this is not a dish but I couldn’t let this post go by without mentioning how amazing these are (and available in lots of different flavours). I adore this photo I took at Aizle. The food here is pretty good stuff and made my 35 club of highest scoring reviews. I think this photo picks up the beautiful colour on this plate. Love this shot of the butternut squash veloute at Purslane. Simple yet elegant and seems to be catching the little light that comes in through the basement window. I was a little slow to take this one and the veloute is escaping the jelly ring, but I still love this photo of my halibut dish at Mark Greenaway’s. It captures the skill of the chef in designing such pretty food. I still have around 80 restaurants in my list to try and there always seems to be something new opening up. There are already plans to go to The Kitchin for Christmas next year and we already have bookings for both fine dining and more easy on the bank balance dining experiences as we move into 2016. Thanks to those who have dined with me and will continue to do so over the next year. Finally, I’d like to thank those of you who have taken the time to read my blog over the last year and I hope at least some of you have found it useful. May you all have a fantastic 2016.